Just Wedeminute: New Zealand how I miss you! One of my all time favorite places that I've ever traveled to is New Zealand! My 1st year of college my grandma took me on a trip to NZ and we had the BEST time. If you want to see one of the most beautiful places on earth just take a trip around to the other side of the world and there is NZ. 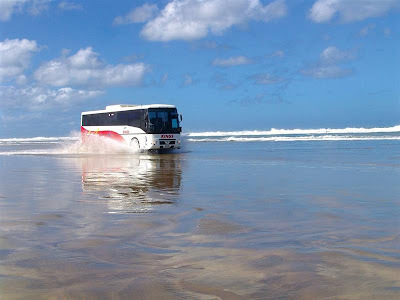 Some of my favorite memories were driving our tour bus on 90 mile beach (yes, I drove it), jetting on the Shotover, snorkeling at the Bay of Island, exploring Kelly Tarlton's underwater world, we stayed on a real sheep farm bed and breakfast, and one of my all time favorite things was riding the helicopter in Queenstown. When I returned from NZ Kevin asked me to marry him and the rest is history! I'm hoping that Kevin and I will get to travel to NZ some day so I can show him some of my favorite spots. I've told Kevin for years that if I could move to NZ I would! The people were amazing and so friendly, the country was beautiful, gorgeous beaches, aqua water and everything was so clean! These are not my videos, just ones that I found...but they give you a great idea of how much fun these activities are! Jen, it was such a great trip and one that I will NEVER forget! We were in NZ for about a month and traveled all over both islands. If you ever go email me and we can get together and I can show you my scrapbook and suggest some amazing things to do, these were just a few of my favorites! We also saw the glow worms, took a boat several boat including a steamship and encountered jellyfish that don't sting!